Collective Leadership is offered to cross organisational groups who are grappling with a complex issue and are open to learning and doing things differently. 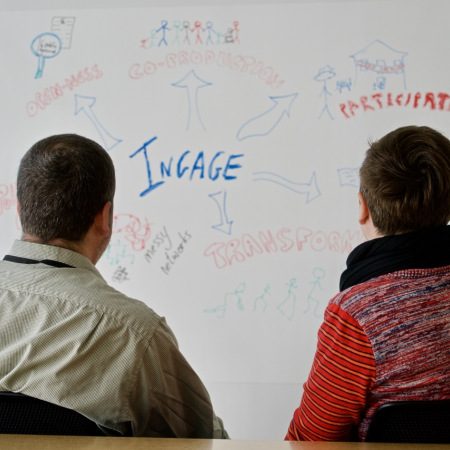 The Dialogue Community of Practice aims to enhance the quality of relationships through conversation, allowing us to work together to improve what matters most to Scotland. The Facilitators Network provides support to public service workers using facilitation tools and techniques as part of their roles. The network meets regularly throughout the year with support offered through a peer learning model. The Leadership Exchange initiative pairs leaders at middle, senior and executive levels in brief exchanges to learn from each other across sectors. The Scottish Coaching & Mentoring Collaborative is a collaborative partnership providing in-house trained coaches and mentors to work across public service organisations. We support clients from first line managers to those in senior leadership and management roles across Scottish Public Services. For more information on Workforce Scotland events, please view our calendar on Eventbrite. Workforce Scotland – Where is that ‘kaftan of weirdness’ now? Read More Workforce Scotland – Where is that ‘kaftan of weirdness’ now?